Chocolate covered brittles from Divine Organics Raw Chocolate (Marin County, CA) are made with certified organic, fair trade, raw chocolate (from Ecuador, Venezuela and Indonesia). 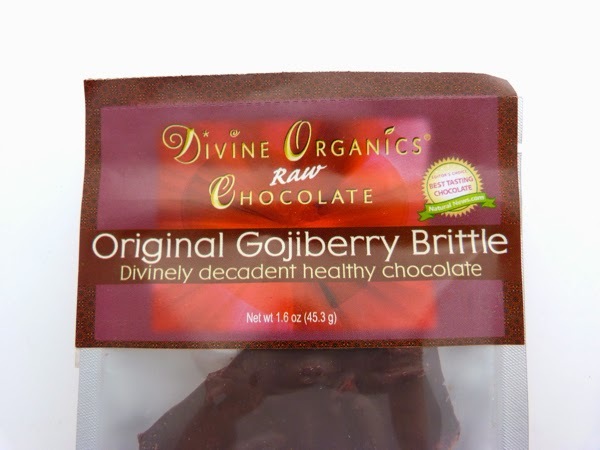 Today's original gojiberry brittle had just 5 ingredients: organic raw cacao, organic maple sugar, organic raw goji berries, organic raw vanilla, and Royal Himalayan pink crystal salt. 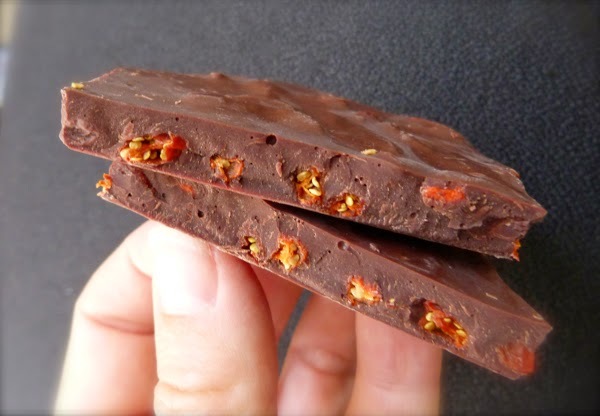 The maple sugar and plump, flavorful gojiberries gave this chocolate a pleasing aroma and flavor. The texture of this brittle was less crackly crisp and more a smooth chocolate bark with a soft, satisfying crunch. Sweet, but not overly so -- like many sugar brittles. Today was Day #4 of Chocolate, Brittle and Bark Theme Week.